During our time pet and house sitting at Ottery St Mary in south-west England we cared for a whole bunch of animals. Pippa, the Springer Spaniel was the star of this show and is easily one of the smartest dogs we have come across. However, in nearby Exmouth, we got to spend time with some of the most awesome creatures on the planet … Up close and personal. 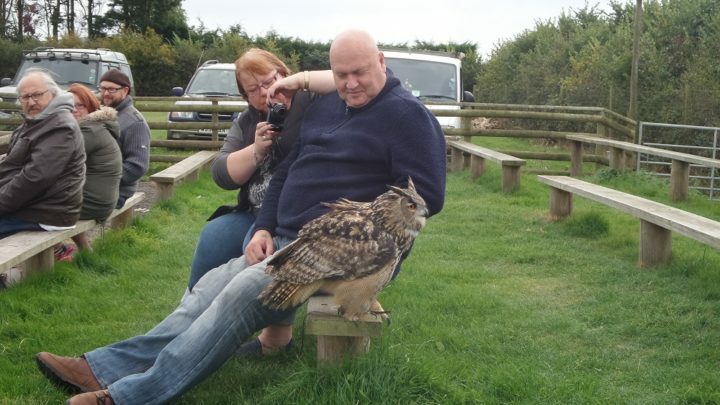 The Hawkridge Birds of Prey Centre is a small family run centre and was where Gai and I experienced the incredible birds of prey. These are what is known as raptors, birds that hunt with their fearsome talons. On cold and blustery English afternoon, we had an ‘insider tour’ of the facility. But first, the stunning public show. It started with a huge eagle owl, which contrary to their relaxed and cool persona, are ruthless hunters. At one stage, the big owl landed next to me on the bench and while it showed little interest in me personally, it did enjoy a closer look at my camera. It’s amazing how some of the crowd reeled every time one of the birds came close, while others embraced the experienced and moved in closer for a photo. Gai had worked on a national wildlife television show for a couple of decades and was used to close encounters with exotic animals. We found the running commentary informative, but it was the action of the birds that was outstanding. It was magnificent watching them swoop from spot to spot to pick up the tiny food rewards. After the show, and once the crowd had dispersed, Gai and I were in for a very special treat. We both had turns at holding Baldrick the American Bald Eagle. Her handlers ‘gloved us up’ with a full-arm-length heavy leather sleeve for Baldrick to rest on. The accoutrements included a forked stick, which helps take the substantial weight of the massive bird. The males of the species are far outweighed by the females who can grow to approximately half the size again. There are very strict rules associated with keeping birds of prey in the United Kingdom. The proprietors of the park, husband and wife team Richard and Sharon Beech, explained that carefully to the crowd during the show and in more detail as we interviewed them for our TV show Village to Villa. Holding Baldrick and being close to some of the other awesome creatures was quite breathtaking. A genuine once-in-a-lifetime moment. Gai and I walked away from the day exhilarated at what we had been lucky enough to experience. Not far from Exmouth is another facility filled with clever animals. It’s The Donkey Sanctuary in the town of Sidmouth. Gai and I were not sure what we would discover at what is Britain’s most financially supported charity. 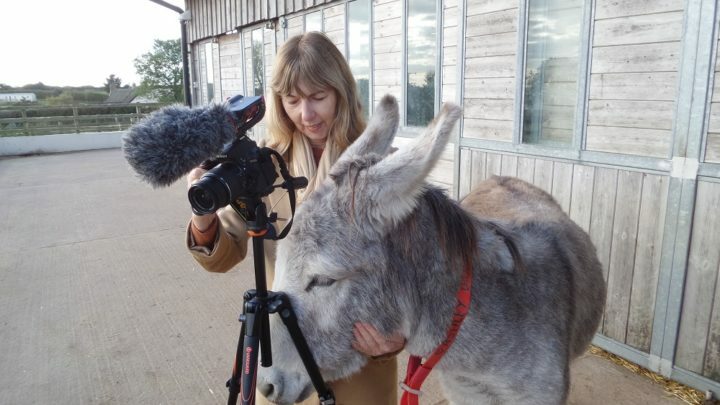 We knew it was established more than 50 years ago by one dedicated British donkey lover called Elizabeth Svendsen and now the organisation has branches worldwide. We knew the sanctuary was quite large with substantial facilities for the care and rehabilitation of donkeys and mules. However, we were not prepared for what we saw. Wow! 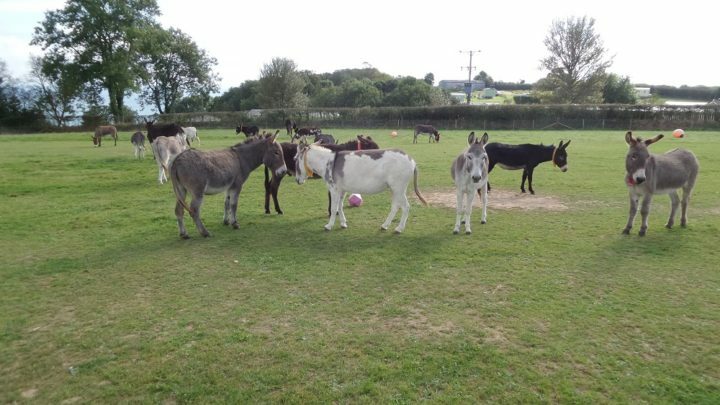 The place is huge and more than 500 donkeys call The Donkey Sanctuary at Sidmouth home. As you enter, there is a large veterinary hospital specifically to treat unwell donkeys.A couple of patients were waiting patiently outside eating lush grass! Gai and I were given a special tour while we shot the story for our television series. We were first taken to some of the huge fenced fields and walked into these paddocks where we were followed and immediately surrounded by dozens of donkeys.They didn’t kick and they did not bite. Rather than feel scared or threatened by the animals, we were as curious about them as they were of us. It was quite surreal. Many people (including us, prior to this experience) have an ingrained attitude that donkeys are dumb and stubborn. However, we can confirm this is not the case. Our hosts explained that donkeys are affectionate, smart and very playful. They love a good scratch up and down their very long ears. They also love to sniff your pockets in case you have any food! With an estimated 44 million donkeys in the world, almost all of them are in servitude. China has the most with 11 million followed by Ethiopia (Africa) with 5 million. 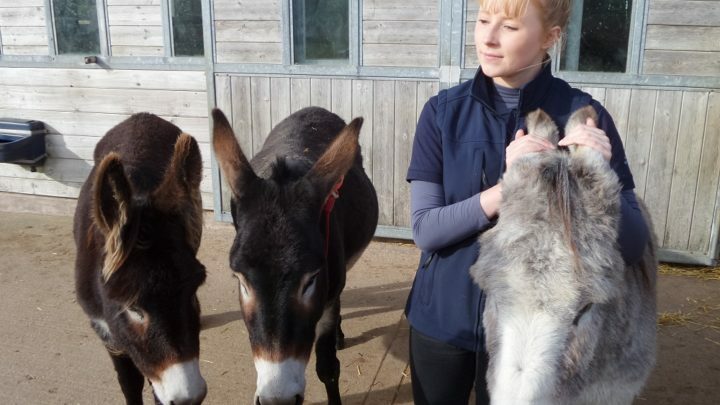 The sanctuary aims to stamp out cruelty and mistreatment of these gentle creatures, and visitors to the facility can sponsor a donkey and even watch what it’s doing on any of six live donkey cams! Our day there was a real eye-opener. Either of these places is worthy of a visit if you are anywhere near Devon on the amazing Jurassic Coast. Have you had a close encounter with animals on your travels? Tell us about it.